A few small changes can make sure you stay in love with your boat in 2018. Make the most of your gym and get fit on board. 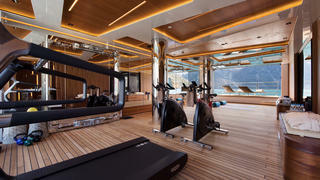 Image of the gym on board Cloudbreak by Christopher Scholey. Mix it up! Making resolutions and small changes on board can can help ward off boating blues, saysKristin Ducote. Obviously he was joking, but the sentiment rings true. There’s almost nothing we love to hate more than our boats. Yachting is a consequence of emotional opposites, swinging from the highest high – a beautiful canopied lunch of crab claws on the aft deck – to the lowest low – an unexpected $24,000 bill for crew uniforms or yet another trip to the “yard,” a word that inspires fear tantamount to death and taxes combined. 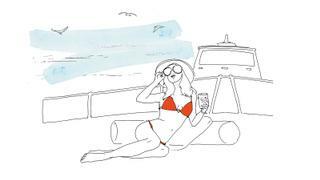 To prevent my friend’s resolution becoming yours, here are some positive yachting resolutions for 2018. The most common pledge - New Year's or otherwise - is to get fit, but a yacht cruise, with endless plates of gooey hot cookies and bottomless cocktails, can throw a wrench in your new diet regimen. Don’t feel bad about sending dietary requests ahead of time. Whether you want to be gluten-free, sugar-free, high-fat or low-fat, your chef will tailor exquisite meals to your requirements. And although it’s easy to park yourself in a lounge chair, novel in one hand, glass of rosé in the other, resolve to get yourself moving. Buy a Peloton stationary bike for your superyacht gym and stream live spinning classes. Instead of taking the tender to survey a new anchorage, launch the paddleboard. Plan an afternoon of family Olympics: think swimming races, beach sprints and a conch shell toss. If all else fails, remember snorkelling is a sneaky way to trick yourself into cardio. Why not defray costs when you aren’t on board? Don’t be afraid to charter. Just take your time and find the right broker. You might suddenly find that your floating beauty can pay for itself. Everything after that is gravy. Lighten the fabrics; brighten the cabins. Update your art. Get rid of that Turner-esqe ship tossing in the waves and find new pieces that are fun and unexpected. Sunny interiors will improve everyone’s mood and draw family back to the boat. Don’t get stuck in a cruising rut. If you always spend the summer moseying up the East Coast, branch out. There’s more to life than the Hamptons. Does the head waiter at Le Club 55 know you by your first name? Give Saint-Tropez a break! Try lesser-known islands in the southern Bahamas or off the coast of South America. The exorbitant price of a new JetSurf or SeaBob might make you blanch, but their expense in relation to their fun metric actually makes them a bargain. Pack a new water toy for each cruise and give your guests a fresh skill to master. Consider a Flyboard, a Seabreacher, or another exhilarating machine from the Superyacht Tenders & Toys website (superyachttendersandtoys.com). Everyone’s heard the saying: “The best days of a man’s life are the day he buys a yacht and the day he sells it.” Here’s hoping with a few carefully made changes, the best day of your life will instead be that one anchored offshore, cabins full of friends and family, a drink in hand, as the sun sinks below the horizon, watching, waiting, and finally seeing that elusive green flash.